The nation is in the grip of a terrible pandemic, with murder cults forming and those affected by the disease being quarantined by the government -- one family does all they can to hide a member from both factions. There’s something terribly wrong with Melissa Kerry. Her husband Andrew sees it. Their teenage daughter Vicki sees it. Melissa is losing herself, falling into the grips of the Empty Man pandemic that is spreading across the nation. Andrew and Vicki do all they can to care for her themselves, to keep her worsening condition a secret from the roving government quarantine crews, but it’s becoming harder and harder...until a strange visitor arrives on their doorstep, offering a cure. 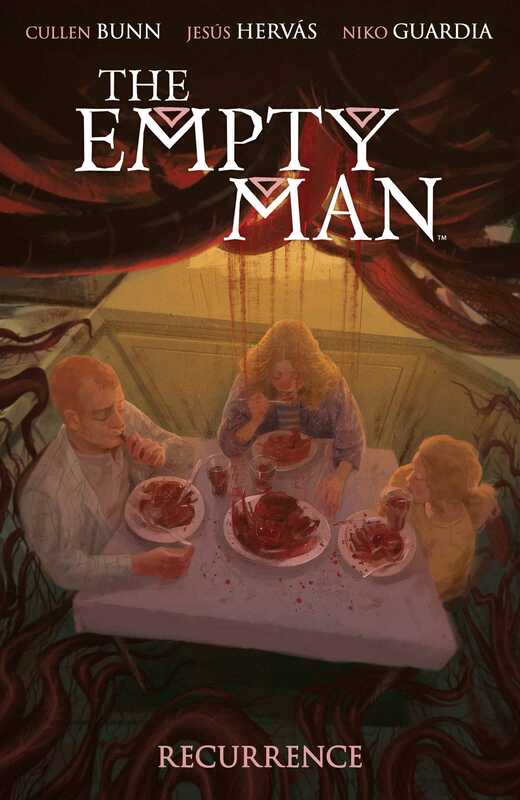 Written by Eisner Award-nominated author Cullen Bunn (Harrow County, Bone Parish) and illustrated by artist Jesús Hervás (Lucas Stand), Recurrence is the second installment in The Empty Man franchise and explores the psychological horror of a family member in decline, and the depths one will go to protect those they love.